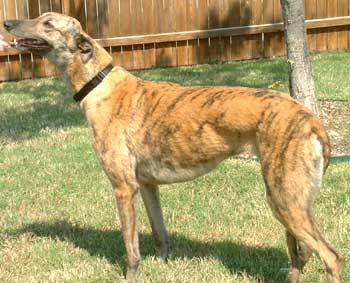 Wilma is a five-year-old beautiful female brindle born in February 1999. She was found as a stray in Wilmer, TX by a woman who had been trying to capture her for about 3 weeks. Finally the woman was able to get Wilma when she was trying to dump over a trash can to get some food. 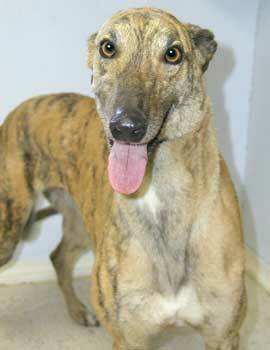 She is very friendly, loves to be with people and enjoys the company of other dogs. She is small animal tolerant and cat trainable. whether they're 3'6" or 6'3"! Wilma seems to miss the company of other dogs, though she adores her foster parents and tries to wrap herself around them whenever possible. She may have been in a home and had some training in the past. Her manners are impressive as she even respects your dinner time! When the family sits down to eat, she leaves the dinner table alone and waits in the other room. Quite a feat for a hound indeed! She has had no accidents in the house and goes outside when necessary, but Wilma appears to be hesitant to stay outside for very long. Perhaps she is afraid of being abandoned and alone again. Hopefully her Forever Home can reassure her once and for all, that this time, she's home to stay.